In 1957, 58-year-old director Alfred Hitchcock, who then had more than 40 films to his credit, filmed his movie Vertigo in San Francisco. The movie stars James Stewart as Johnny (Scottie) Ferguson, Kim Novak as Madeleine Elster/Judy Barton and the city of San Francisco as itself. According to Herbert Coleman, Vertigo associate producer, Hitchcock often picked a location and then developed a story to be filmed there. He liked to show a familiar place and introduce a twist of malice. When he first saw San Francisco, he said it would be a good place for a murder mystery, and he chose a French novel, D'Entre les Morts (From Among the Dead). It's a story of deception and obsession, of love lost and regained, and of course, ends with Hitchcock's signature plot twist. The movie was not well received when it was released in 1958, but it has developed a following. Martin Scorsese is quoted as saying Vertigo is "like being drawn into a very, very beautiful comfortable, almost nightmarish obsession." Classic film expert Brad Lang, says "I still haven't quite come to a conclusion about the film, but regardless of whether you think the film is Hitchcock's masterpiece, or a confusing trip through his twisted psyche, you have to admit that it shows off a lot of San Francisco landmarks." Some of the movie's locations were real, but there were also 50 studio sets. Of the real locations, most survive relatively unchanged. Jesse Warr of A Friend in Town, who offers a Vertigo Tour, describes them this way: "Vertigo's locations link the eras, styles and times of San Francisco". Visiting them all will take most of a day and you will need a vehicle (or a reservation with Jesse) to reach all of them. Mission Dolores: (3321 Sixteenth Street) Madeleine visits Carlotta Valdes' grave here (also a studio prop). Founded in 1776, it was the third in a chain of 21 California missions and served the area's original inhabitants, the Ohlone Indians. Palace of the Legion of Honor: (Lincoln Park near 34th Avenue and Clement) Madeleine stares at the painting of Carlotta Valdes inside (the painting was a movie prop). 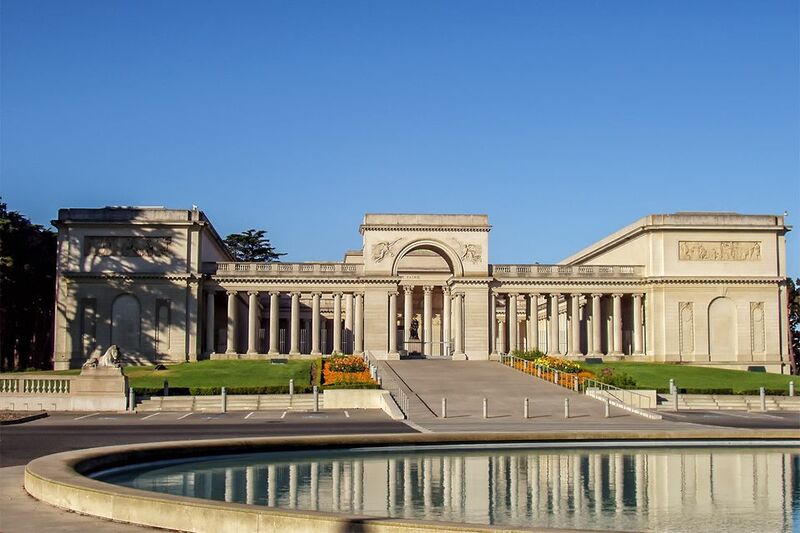 Founded by Alma de Bretteville Spreckels and her husband Adolph B. Spreckels (the sugar magnate,) it was built for the Panama Pacific International Exposition of 1915, but it was conceived from the outset as a museum of fine art. Fort Point: (below the south anchorage of the Golden Gate Bridge) Madeleine jumps into the water here. Don't go looking for the steps that Scotty carries her up; they were constructed for the movie. Fort Point was begun in the mid-1800s and grew obsolete before it was completed. Joseph Strauss, father of the Golden Gate Bridge, insisted that the bridge's anchorage not disturb the historic fort. Palace of Fine Arts: (3301 Lyon Street) Scotty and Madeleine stroll near the lonely remnant of the 1915 Pan-Pacific Exposition, which is still a popular place for lovers. Scottie's Apartment: (900 Lombard Street at Jones) It's just down the hill from the famous "crookedest" street. Ernie's: (847 Montgomery) Scottie first meets Madeleine here, but it the bar is now closed and the building is being converted into condominiums. Nob Hill: You will find Madeleine's apartment building, The Brocklebank Apartments, at 1000 Mason across from the Fairmont Hotel and the Empire Hotel where Judy lived at 940 Sutter Street, near Hyde. The name has changed, but the building is still there. In a scene that was cut from the movie, Gavin Elster, Madeleine's husband says: "You know what San Francisco does to people who have never seen it before... Everything about the city excited her; she had to walk all the hills, explore the edge of the ocean, see all the old houses and wander the old streets; and when she came upon something unchanged, something that was as it had been, her delight was so strong, so fiercely possessive! These things were hers." Perhaps you will gain a little of Madeleine's love for the city by the time you've finished the tour.